43 ½ x 24 ¼ in. Agnolo Gaddi was heir to the great Florentine painting tradition of Giotto (1266-1337), the acknowledged father of the Italian Renaissance. Gaddi inherited his father's workshop, which he directed very successfully until the end of the 14th century. 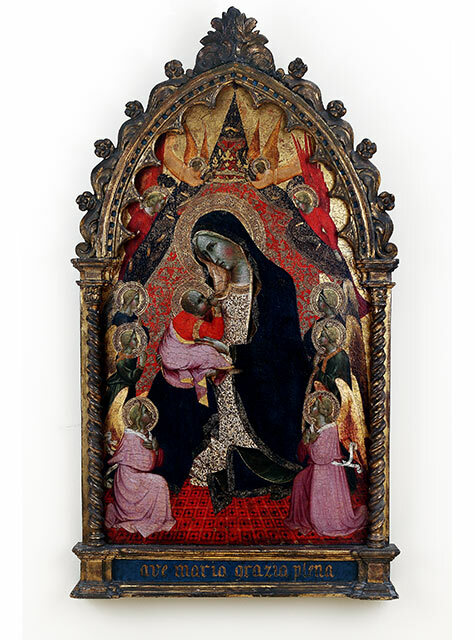 The Cummer Museum’s panel is rare because it is one of the very few small works completed entirely by Gaddi. His skill is demonstrated in the acute attention to detail, especially in the elaborate tooling and punching of the gold leaf found in the background and halos. Many of these specific punch marks can be seen in Gaddi's other works. The Madonna is shown suckling the Christ Child while seated on the floor with her head bowed. This humble portrayal of the Madonna became prevalent in 14th-century Italian painting and was a result of the humanization of the Virgin Mary as a mother. Two hovering angels hold a crown over her head, revealing that the Madonna is also the Queen of Heaven. To emphasize this royal reference, she is clothed in a beautiful blue mantle that is lined in green and trimmed in gold. The robe underneath is decorated with an intricate gold pattern. The patterning is continued in the cloth of honor that is held aloft by two red-clad, red-winged heavenly angels.